I want something everyone can be happy with. Why can’t everyone have everything they want? Why can’t we take down the artificial barriers that are blocking the outlet to Minnehaha Creek from Lake Hiawatha? Why can’t we dredge Lake Hiawatha to restore its clarity and dump that sand behind the bern and build up the fairways by 6 to 8 feet? Won’t that stop the need for pumping? Why can’t we have fruit trees? Why can’t Sean have his storm sewer mitigation? It could be an interesting water hazard. And, then, why can’t we have an 18-hole golf course to preserve an important cultural heritage for South Minneapolis? 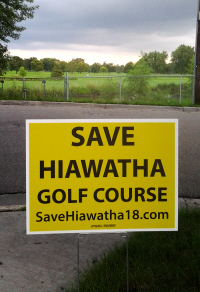 Ed, If you truly feel (and savehiawatha18 agree) that a 9-hole course is destroying this asset, then please convey these thoughts to the Park Board. I imagine if golfers don’t actually want a 9-hole course, they would take that into account. What “larger questions” have not been answered? I keep asking, but do not get any specific examples. As you read this week, the modeling to date has already confirmed that lowering creek levels by 1 foot will not address the pumping issue. If Wagenius was aware of this (and other modeling that has already extended beyond “localized studies”), she might not have made that statement. Note: Please let me know what questions you plan to ask in the next installment of your column, and I can help answer them before they are published. The resolution for a 9-hole course is a compromise. The park staff, including the director of golf operations, had already decided against a 9-hole alternative because they are trying to make the golf system financially sustainable. However, improving water quality is a priority, and reducing pumping also allows for restoring wetlands to accomplish this goal, so the compromise was to reverse a decision against 9 holes and to proceed with water quality improvements. See above. If golfers can’t be happy with a 9-hole course, speak now so we can avoid creating one. Like having a cake and eating it too? This approach has already been studies and won’t solve the problem. In addition to other, well documented reasons. Why can’t we dredge Lake Hiawatha to restore its clarity and dump that sand behind the bern and build up the fairways by six to eight feet? Please share your evidence that dredging will restore clarity. One reason would be that burying the course in 8 feet of dirt would kill every tree. This also does not address storm water quality, and as has already been well documented, improving water quality is a high priority. No. If the lake was dredged and even if the course were buried in 8 feet of dirt, as soon as the pumping stops, the water table would rise to the level of the lake and this would flood homes. This is why proposals have NEVER said pumping would stop. There seems to be an interest in making 18 holes fit in spite of the lack of usable area, so I would assume there may no longer be space for fruit trees, and if there is, they will be getting hit by golf balls. Why can’t we have storm sewer mitigation? It could be an interesting hazard. Filtering storm water involves restoring wetlands. It is not simply a water feature. It would actually be a reasonable question to ask for estimates on how much area would be required for the predicted storm water volume. A similar storm water project in Hopkins is using 12 acres of new wetlands, not a small area. And, then, why can’t we have an eighteen hole golf course to preserve an important cultural heritage for South Minneapolis? See above. The stated reason that the new compromise resolution requires at least a 9 hole course is to preserve cultural heritage. If golfers don’t think that a 9 hole course meets this objective, speak now. I’ve asked you before, please show me a link to the modeling study that shows lowering the water level of Lake Hiawatha by one foot will not seriously diminish flooding and pumping. Also, why one foot, when the Barr study said 1.9 feet? Some compromise. You get what you want and we get a cultural institution destroyed. Oh, now I see, it was a compromise between the Olympian gods who live on the River Road rather than a compromise worked out with mere mortals who actually live in the area. Gravity. Particulate matter fall to the bottom. Deeper water, more clarity. Me: But your plan to flood the course will not kill the standing trees??? Me: You’re right, and it doesn’t address the price of tea in China either because that question is not relevant to the discussion of flooding and pumping. We have a President who loves to distract by pointing to another shiny object when someone brings up something unpleasant that he doesn’t want to deal with. Can’t we please stick to the topic and document our sources. You do believe that lowering the OUTLET by 2 feet by removing the three unnatural obstacles would lower the level of the lake by 2 feet, don’t you? You do believe water flows downhill, don’t you? Fruit trees? Why don’t we plant fruit trees on park land along Minnehaha Parkway. They would be very visible and easily accessible. Why not try that before you think you need to destroy a seventy-year-old cultural institution in order to plant fruit trees in a swamp where the roots will rot? OK. How much area do you think would be required for the predicted storm water volume? And, a question for you, why did you decide to put all the wetlands in the middle of the front nine? Why couldn’t they be designed to accommodate a plan to preserve nine holes of golf on the frontside and still aerate the effuse? Are you willing to allow golfers from South Minneapolis help design a challenging and beautiful front nine that would satisfy reasonable ecological standards? He’s a Post Doctoral Research Fellow at Minneapolis Medical Research Foundation doing research on a patient-centered redesign for organ transplant patients to evaluate and select a transplant center. He was a lecturer at the University from September 2015 to May 2016 teaching product design courses. He has been part of a design team for cardiac pacemaker leads and ceramic spine implants. He is obviously very bright and uniquely qualified to be part of a design team to improve water quality at Lake Hiawatha. But let’s settle the questions surrounding flooding and pumping before we go on to the problem of water quality.